According to U.S. EPA, approximately 35 million tons of food waste was generated in 2010, with 97 percent ending up in landfills or incinerators. Food waste is an emerging issue with environmental, social, and economic impacts, and UT Arlington recognizes the importance of minimizing food waste on our campus. We approach this issue in multiple ways, including collaboration with our dining services provider, involvement in the EPA’s Food Recovery Challenge, and development of our award-wining composting program. Chartwells, UTA’s dining services provider, purchases 100% certified seafood, cage-free shell eggs, grass-fed beef, rBGH free milk and chicken, turkey and pork produced without the routine use of antibiotics. Chartwells offers Fair Trade Certified sustainable coffee on many campuses. They are committed to purchasing locally grown and organic produce whenever possible in support of local communities. Chartwells’ Balanced Sustainability approach addresses four basic tenets of sustainable and socially responsible business practices: Eat Green, Build Green, Run Green, and Return Green. These practices include such programs as trayless dining service and Project Clean Plate, which promotes food waste awareness. Trim Trax tracks, measures and reduces kitchen waste. Chartwells use biodegradable consumer food packaging, plates, and utensils made from compostable materials such as bamboo and corn byproducts. They provide reusable food and beverage containers as well as reusable shopping bags. Many of the campus vans run on bio-diesel fuel, and encourage facilities to use environmentally-friendly cleaning products. Chartwells’ commitment to sustainability is outlined in their Sustainability Platform. UT Arlington is one of 50 colleges and universities in the United States and among the first in Texas to become a partner in the U.S. EPA’s Food Recovery Challenge, a food waste reduction initiative within the EPA’s WasteWise program. Partners commit to at least a 5% increase from their baseline year in at least one of the three food diversion categories (prevention, donation, and composting) or to a combined 5 percent increase across all three food waste diversion categories. In 2014, UTA was the recipient of EPA’s award for Leadership in reducing food waste. When food decomposes in landfills, it generates methane, a greenhouse gas that is 21 times more potent than carbon dioxide. Composting food and other organic waste can reduce its climate impact while retaining vital nutrients for reuse in campus gardens and landscaping. The University’s composting annually composts 32.4 tons of food waste from on-campus dining services and off-campus coffee shops and hospitals as well as yard waste collected from campus ground crews. The University uses the compost as mulch and soil amendment on campus grounds and in the new community garden. The program has received numerous awards from The Recycling Alliance of Texas, the Greater DFW Recycling Alliance, and the North Texas Corporate Recycling Alliance. 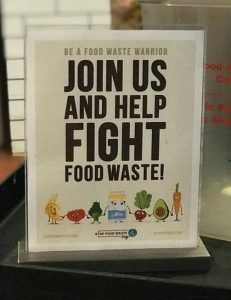 More than 22 million pounds of uneaten food is thrown away on college campuses each year, according to Food Recovery Network, a student-driven nonprofit dedicated to reducing food waste and hunger at higher education institutions. A single college student generates an average 142 pounds of food waste per year, according to Recycling Works, a Massachusetts recycling assistance program. The unconscious habit of wasting food is greatly at odds with the amount of people who need it: nearly 15 percent of the population (47 million people) lives below the federal poverty line. Therefore, food waste on such a large scale is not only an economic issue and environmental issue, but it also ties in with social sustainability. Raising awareness among students is critical for change to happen. Institute for Sustainability and Global Impact in collaboration with UTA Dining Services hosted Weigh the Waste events during lunch time in the cafeteria to educate the importance of reducing food waste. Weigh the Waste collects and measures plate-waste generated by diners as a way to identify opportunities for reducing and creating awareness around food waste. The food that is over on the student’s plate is weighed when they bring the plate back to the conveyer belt for washing. 362 lbs of food waste was collected and weighed over a period of 3 days with a student count of 1,861. In addition to providing useful information about what sorts of things end up in the waste stream in dining halls, the events serve to inspire students to consume less. Students as they left the dining halls after the events said they would take less food in general in the future.